The hunt for dark matter has taken another step forward thanks to new supercomputer simulations showing the evolution of our "local Universe" from the Big Bang to the present day. Physicists at Durham University, UK, who are leading the research, say their simulations could improve understanding of dark matter, a mysterious substance believed to make up 85 per cent of the mass of the Universe. The visible galaxies in the Local Group simulation, shown in the lower right, only trace a tiny fraction of the vast number of dark matter halos, revealed in the upper left. Professor Carlos Frenk, Director of Durham University's Institute for Computational Cosmology, said: "I've been losing sleep over this for the last 30 years. "Dark matter is the key to everything we know about galaxies, but we still don't know its exact nature. 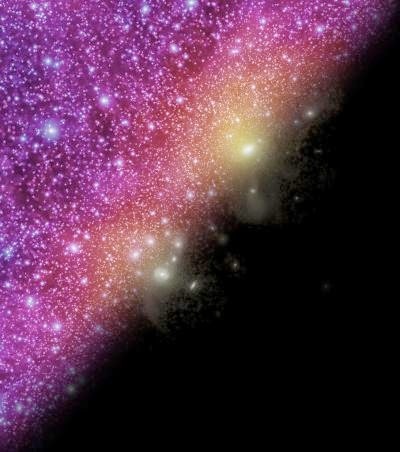 Understanding how galaxies formed holds the key to the dark matter mystery." Scientists believe clumps of dark matter – or halos – that emerged from the early Universe, trapped intergalactic gas and became the birthplaces of galaxies. Cosmological theory predicts that our own cosmic neighbourhood should be teeming with millions of small halos, but only a few dozen small galaxies have been observed around the Milky Way. Professor Frenk added: "We know there can't be a galaxy in every halo. The question is: 'Why not?'." The Durham researchers believe their simulations answer this question, showing explicitly how and why millions of halos around our galaxy and neighbouring Andromeda failed to produce galaxies and became barren worlds. They say the gas that would have made the galaxy was sterilized by the heat from the first stars that formed in the Universe and was prevented from cooling and turning into stars. Description: Gas in the EAGLE Simulation, showing hot bubbles (red colors) surrounding large galaxies, connected by colder filaments (blue and green colors). Inserts zoom in on the Local Group around the Milky Way and show the distribution of gas, stars and dark matter. However, a few halos managed to bypass this cosmic furnace by growing early and fast enough to hold on to their gas and eventually form galaxies. The findings will be presented at the Royal Astronomical Society's National Astronomy Meeting in Portsmouth today (Thursday, June 26). The work was funded by the UK's Science and Technology Facilities Council (STFC) and the European Research Council. Professor Frenk, who will today (Thursday, June 26) receive the Royal Astronomical Society's top award, the Gold Medal for Astronomy, added: "We have learned that most dark matter halos are quite different from the 'chosen few' that are lit up by starlight. "Thanks to our simulations we know that if our theories of dark matter are correct then the Universe around us should be full of halos that failed to make a galaxy. Perhaps astronomers will one day figure out a way to find them." Lead researcher Dr Till Sawala, in the Institute for Computational Cosmology, at Durham University, said the research was the first to simulate the evolution of our "Local Group" of galaxies, including the Milky Way, Andromeda, their satellites and several isolated small galaxies, in its entirety. 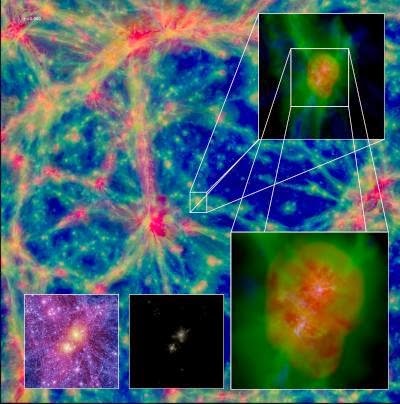 Dr Sawala said: "What we've seen in our simulations is a cosmic own goal. "We already knew that the first generation of stars emitted intense radiation, heating intergalactic gas to temperatures hotter than the surface of the sun. After that, the gas is so hot that further star formation gets a lot more difficult, leaving halos with little chance to form galaxies. The DiRAC Cosmology Machine, operated by Durham University has 6720 Intel Xeon Cores and 53,760 GByte of RAM. "We were able to show that the cosmic heating was not simply a lottery with a few lucky winners. Instead, it was a rigorous selection process and only halos that grew fast enough were fit for galaxy formation." The Durham-led simulation was carried out on the "Cosmology Machine", which is the part of the DiRAC national supercomputing facility for research in astrophysics and particle physics funded by the Department for Business, Innovation and Skills through the STFC. The Cosmology Machine – based at Durham University – has more than 5,000 times the computing power of typical PCs, and over 10,000 times the amount of memory. 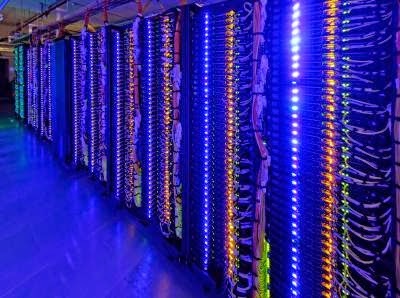 The research is part of a programme being conducted by the Virgo Consortium for supercomputer simulations, an international collaboration led by Durham University with partners in the UK, Germany, Holland, China and Canada. The new results on the Local Group involve, in addition to Durham University researchers, collaborators in the Universities of Victoria (Canada), Leiden (Holland), Antwerp (Belgium) and the Max Planck Institute for Astrophysics (Germany).